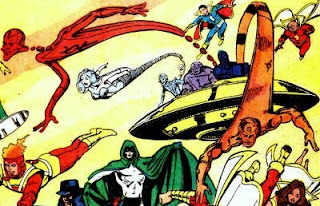 Welcome to my nascent blog's part of Crisis on Earth-Blog: The DC Challenge, a multi-blog crossover featuring trivia challenges and other adventures. While my blog doesn't focus on a specific character, I do have my favorites. And one of those favorites is the Metal Men. And that's who I'll be representing! Now, if this is your first visit, welcome! And if you're here because of the crossover, well, thank you to Frank Diabolu for creating this mind-blowing blog crossover challenge and...welcome! Who are the Metal Men? The Metal Men are a team of shapeshifting robots created by Doctor Will Magnus. Each robot consisted of a different element: Gold, Mercury, Tin, Iron, Lead, and Platinum. Doc Magnus invented a device called a "responsometer," which, when placed in each of these metals, brought on the inherent personalities of each metal. Gold is noble, Mercury is hot-headed ("mercurial"), Tin is weak, Iron and Lead are strong, and Platinum suffers from a "faulty" responsometer which makes her act like a human girl. This makes Platinum hopelessly in love with Doc Magnus, which he never reciprocates (though he does care for her), and he constantly has to dodge her advances. It all makes for classic situational comedy. Click here for the Metal Men Crossword Challenge. The other is a Choose-Your-Own-Adventure story featuring the Metal Men, amongst others. (What other Lissbirds's favorite characters will pop up?) I hope you enjoy it. Because, really, that's what I think comics are all about: having fun. If you haven't had a chance to read any Metal Men comics, or are only familiar with them through cameos in JLA titles, I highly recommend Showcase Presents: The Metal Men Volume 1. 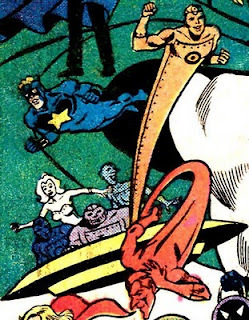 If you like Silver Age levity and socially-awkward genius inventors who wear loud suits, or if you have an affinity to I Dream of Genie, odds are you'll probably enjoy the Metal Men. Who is J'onn J'onzz to you? When she's not obsessing over comics, Liss obsesses over classic movies and ballet. Her sole ambition in life is to own a lemur. And to publish a novel. Oh, and to become Supreme Dictator of the World and institute a four-day work week, National Squirrel Appreciation Day, and make it a law that all men must wear hats, preferably Fedoras. In her spare time she enjoys sarcasm, lolcats, and things that are purple. Hopefully this blog will do a lot of insightful pondering about the comics world. And hopefully you'll enjoy it. Enjoy the purple, at least. If you'd like to drop me a line you can e-mail me at: lissbirds at gmail dot com. Links That Make Me Happy!